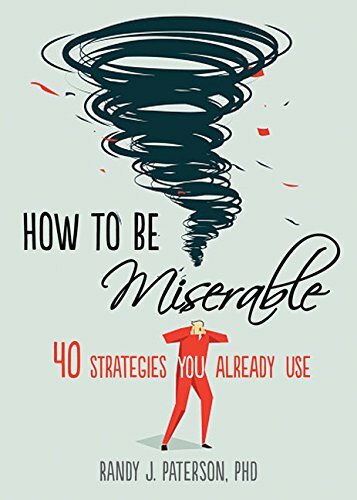 On May 1 of this year New Harbinger Publications will release my latest book, How to be Miserable: Forty Strategies You Already Use. In it, I invite readers to contemplate how they could reduce their happiness and life satisfaction if, for some reason, that was their goal. Why bother? Most of us spend much of our lives trying to arrange things so that we feel happier and more contented with our lives - and often we feel stuck or frustrated. We never ask ourselves how we could feel worse. But doing so can illuminate a road that runs in both directions. By understanding how we could lower our mood, we can often see more clearly how to raise it. At talks on this topic I invite attendees to list their own top three ways to become miserable. In a recent post I provided 10 sets of replies. Here are the answers from 10 more attendees. How do they compare with your own? Do not talk to friends and family. Be stuck at home where I can't walk on the seawall. Watch television for the whole week. Question your own abilities and lower your self-esteem. Be scared or fearful to live life. Surround myself with people who only focus on the negative. Do not have genuine friends or relationships. Do not have aspirations or goals. Stop talking to friends and family. Eat at McDonald's every day. Never go outside, especially avoid natural environments. Become unable to read books, ever. Not being able to hear music again. Having to live in a messy and disorganized environment. Resign from my volunteer organization. Compare myself to other people, particularly friends. Try to be perfect in every way. What about you? If you could change only three things in the quest for unhappiness, what would YOU do? How to be Miserable is available for pre-order from Amazon and other online booksellers now. How to be Miserable, Take One: What would you do if you wanted to be LESS happy? I have been giving talks on this topic for the past few years, and as a part of the presentation I invite the audience to write down their own ideas, with one restriction: They can only change three things about their lives. What would help the most? Here are the verbatim answers from 10 of these individuals. How do they compare with your own? Live in a place with no view: claustrophobic and little outside light. Find out that the person you just met and thought was terrific is actually controlling and erratic. Spend more money than you have coming in. Spend endless hours reliving all of your past mistakes. Surround yourself with miserable and angry people. Have no goals for yourself. Lose all my old friends and don't make new ones. Work longer hours doing things I dislike for less money. Do not progress through life goals, instead only moving further away from them. Choose not to forgive people: Friends, family, co-workers, strangers, etc. Get stupidly, wildly in debt by purchasing things I don't need (a mortgage would be okay though). Don't drink coffee for the rest of my life. Go shopping all day, every day. Eat whatever I crave, whenever I want. Participate only in activities I have no interest in. Associate only with inauthentic people. Get very drunk every day. Isolate myself from communication with others. Live in an area with more traffic and other city pollution without the possibility of getting out. Sit for more than four hours a day in the basement suite. Have no vision, goals, or daily "tasks" to follow. Stop smiling and talking to others.